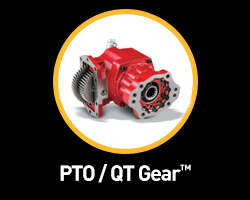 Introducing the QT Gear™ from Parker Chelsea Products Division, a patent pending sound dampening technology which can be applied to Parker Power Take-Offs (PTOs) that are engine driven by a live PTO drive gear in the transmission. The new gear assembly design smooths out torsional vibrations found in diesel engine applications while maintaining durability & torque capacity of the PTO. Its performance has been evaluated with extensive engineering analysis. Drivers of work trucks will appreciate the quiet operation of a PTO with QT Gear technology, improving the comfort of their ride and helping their productivity. Parker Chelsea also offers an engineered support bracket helping to ensure easy installation. 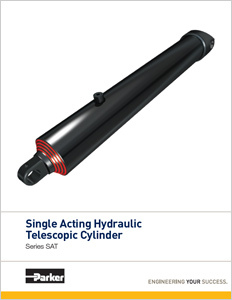 Parker Cylinder Division has redesigned the Single Acting Telescopic (SAT) hydraulic cylinders* to improve productivity and reduce long-term costs. A higher pressure rating (2,500 psi / 127 bar) allows customers to downsize their cylinder and potentially their hydraulic reservoir. Decreased space between stages results in an average weight reduction of four percent. 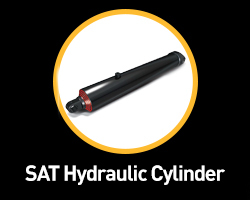 The redesigned SAT requires less working fluid to fill the cylinder which culminates in a average reduction in cycle time of 14 percent. An average of 25% improvement in column strength is accomplished from increased wall thickness of the high strength tubing and wider wear bearings. Polyurethane U-cup seals and umbrella-style wipers offer a more robust sealing package to minimize water and contaminate ingression. 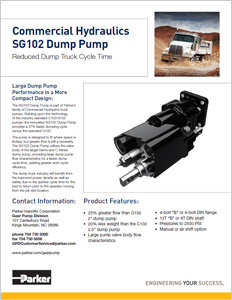 Parker Gear Pump Division offers the SG102 Dump Truck Pump, part of its Commercial Hydraulics truck pump line, putting high performance in a compact design. 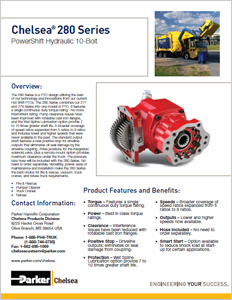 It can be configured in SAE or DIN flange, NPT or ODT ports, with manual or air shift configurations. Built on the technology of the industry standard C102/G102 pumps, the SG102 offers improved power densities with 25 percent more flow than the G102 2" dump pump and 20 percent less weight than the C102 2.5" dump pump. 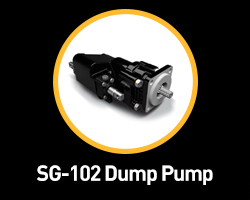 The SG102 uses the valve body of the larger frame size C Series, providing large dump pump flow characteristics for a faster dump cycle time, yielding greater work cycle efficiency. The pump is designed to fit where space is limited, but greater flow necessary. 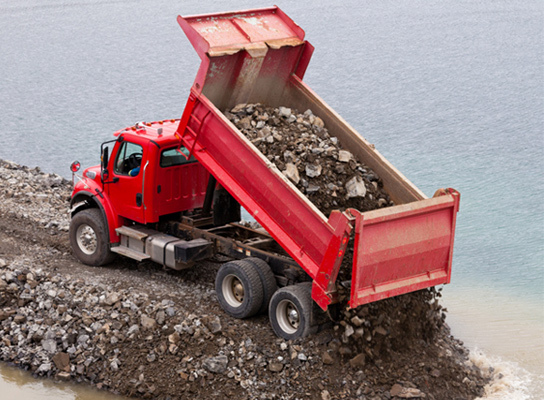 This video demonstrates the speed and efficiency of the Parker Dump Truck System (installed in the truck on the right).